The Town youngsters take on the Robins knowing the winners will travel to take on the giants of Arsenal in round three, and Brady is hoping his players will rise to the occasion. The Cobblers certainly did that in the first round when they saw off King’s Lynn 4-0 in front of a crowd of more than 500, and Brady is looking forward to seeing his players once again perform on the big stage. “It’s fantastic and we are really looking forward to it,” said the U18s boss. “We appreciate all the support we had from our academy teams, academy families, and then the outside support as well, the Northampton fans. First team boss Keith Curle will be in the crowd to again run the rule over the club’s highly-rated batch of youngsters, and Brady said: “These boys are desperate to get into the first team, and to have the exposure of playing at the first team stadium is a great opportunity for them to showcase themselves in front of the manager. On Curle being at the game, Brady added; “It is more of a level opportunity for our players, because they will be playing against a side that is in our category, category three. “Swindon are a good side, they are a strong side, and a physical side, and I think it will be better for the first team manager to see the boys against similar type players. Town go into the game off the back of their first defeat of the season, with Brady’s men falling to a 2-1 EFL Youth Alliance loss at Leyton Orient on Saturday morning. The U18 boss’s plans were hindered on that occasion by the fact three of his players, Jay Williams, Camron McWilliams and Morgan Roberts, were all unused substitutes for the first team’s FA Cup trip to Lincoln City. The trio will return to the U18s fold for Wednesday night’s game, with Williams set to skipper the side, and Brady believes their exposure to footballing life at a hostile stadium like Sincil Bank can only be good for their development. 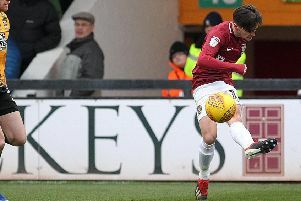 “The most important team at the football club is the first team, and it is great that the boys got the experience to even sit on the bench and sit in front of a crowd that was probably baying for Northampton’s blood,” said the former Brackley Town boss. Brady has a clean bill of health for the clash against Swindon, and he is looking forward to seeing how his players respond to the extra little bit of pressure they will be under. “We have everybody back fit and we are really looking forward to the game,” said the Town boss. “Development is the key (with a youth team), but this is a knockout competition and the result does matter because the team that wins goes through the next round. Admission to the game is £3 for adults and senior citizens, and £1 for under-18s.